The high-speed train from Xi’an North Railway station takes 30-45 minutes and costs 55 yuan (US$8). Alternatively the slow train takes two hours (20 yuan (US$3).Standard price for park entry is 180 yuan (US$26), concessions available, and is valid for two days.Shuttle buses from the tourist center go to either the North or West gate.Cable cars cost 140 yuan (US$20) each way in peak season March 1-November 30) and 120 yuan (US$17) in the off season (December 1 to February 28). Students and children pay a reduced price.If day-tripping from Xi’an, you will probably only have time to walk either up or down, taking the cable car the other way. I would recommend walking up early while you still have energy, and taking the last cable car down. At peak season you may wait from one to three hours for the cable car ride up the mountain. The paths are well signed, providing distances and estimated walking times between peaks. Layer up – the weather changes quickly!Returning to Xi’an: either take a taxi back to Huashan North Station and a return train back to Xi’an, or catch one of the many buses available from Jade Spring Temple to Xi’an Railway Station. 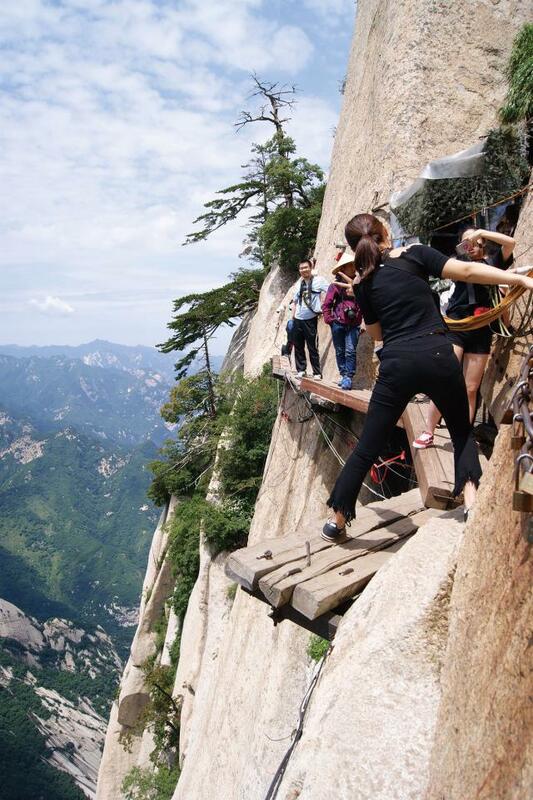 Often referred to as the most dangerous hike in the world, Huashan – or Mount Hua – is home to some of China’s most awe-inspiring views and vertigo-inducing walks. While recent safety measures mean that it is no longer as dangerous as some would claim, it’s certainly enough to get your heart racing. 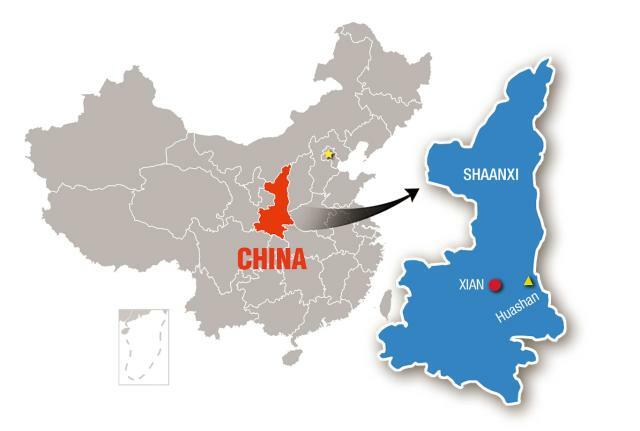 nearby bustling city of Xi’an, capital of Shaanxi Province. Rising early, we caught the first high-speed train to Huashan North station, a scenic ride which provided us with our first glimpse of Huashan’s impressive form. On arrival, we were mobbed by taxi drivers, who insisted there were no buses and that they were our only chance of reaching our destination. Savvy to such ploys, we walked past them to where a green minibus was waiting to carry people up to the visitor center, free of charge. Tickets to the park include transportation via shuttle bus to the north side where we began our hike. There is a longer, much more challenging hike from the West Gate which provides an even more scenic journey (and gloating privileges), but if you’re doing a day trip, you will not have time to take this route as well as visit all the main attractions at the top. It took two hours to reach the top of the North Peak cable car, a relatively quiet climb providing glimpses of the mountain’s drama-tic scenery which has remained unchanged for thousands of years. Far below us the Yellow River wound its way like a silver ribbon across the plain. After admiring the stunning views from the North and Central Peaks, we made our way toward what had initially drawn us to the mountain – the infamous Plank Road in the Sky. Built into the side of the East Peak, a wooden plank walk drilled into the rock hovers over several hundred meters of thin air. 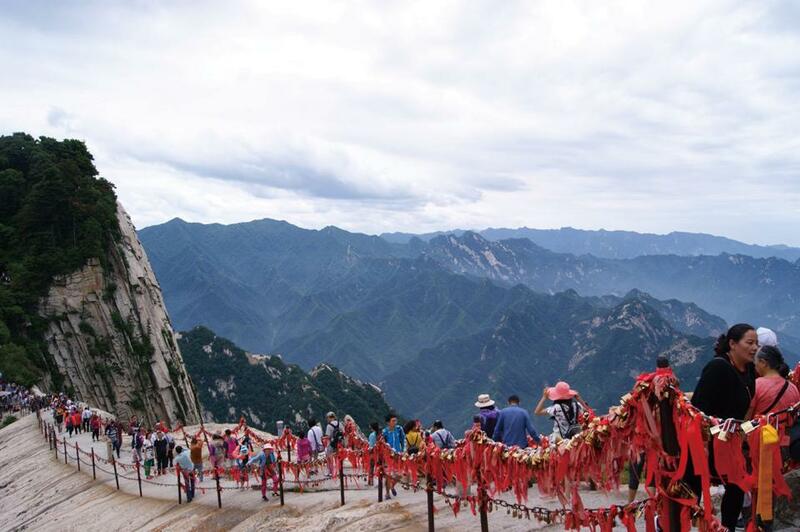 For a small fee – about 30 yuan (US$4.3) for a harness, tourists can purchase a substantial adrenaline rush, as every day crowds flock to make the return journey along the walkway to a tea house a terrifying two dozen meters away. As we approached the East Peak we began to hear shrieks (both male and female) echoing from the cliff side where tourists who, despite a crippling fear of heights, had ventured, seduced by the promise of extremely beautiful views and daredevil photos. Before too long we reached the front of the line where we were fitted with a harness, which we were later advised would have done fairly little to stop us from plummeting to the ground should we have fallen. Luckily no one lost their balance, although I’ve heard rumours that around a hundred people a year lost their lives following a swift descent from the spot. We clipped ourselves onto our lifeline (a single steel cable) and, after leaving our possessions by a small temple where some people were praying rather vehemently, we made our way down a steel ladder drilled into the mountainside, stopping frequently to let returning, pale-faced adventurers clamber over us. This was actually much more nerve-wracking than the actual plank walk itself, as we were all hooked to the same vertical cable – if someone fell, they wouldn’t be going down alone. The plank walk itself would have been rather tame, had we been the only visitors – it was made rather less so by the efforts of elderly tourists who clung to us as they passed, yanking at our harnesses as if their life depended on it. I got the strong impression that they would have happily sacrificed us to the mountain gods had it guaranteed them safe passage back to their tour bus. The whole return trip took about an hour, most of which was spent waiting around due to traffic on the walkway, but the breathtakingly beautiful views kept us entertained and we snapped hundreds of photos. In fact, the whole process felt pretty safe – that is until one man stopped me on the most precipitous point of the return climb to attempt a selfie with me, stepping on my hand in the process. Happy to be back on solid ground we spied, with amusement, a green screen photo booth providing simulated plank-walk photos. A short hike later and we were at the South Peak, which at 2,154 meters is the highest peak of Huashan, and the view from the top is accordingly absolutely spectacular. Beside the stone slab marking the peak is a heavenly pool which is said to never dry up in the dry season, nor overflow during the rainy season. I was tempted to stay and examine this for myself as dark clouds began to roll in, but instead we continued on to the more touristy West Peak. It is said that the changeable weather conditions do not detract from, but rather add variety to the beautiful mountain landscapes, with “Snowy Huashan” and “Cloudy Huashan” being particularly popular. We tried our best to appreciate the beauty of “Torrential Rain Huashan” while making a beeline for the cable car station. The ride down the West Peak Cable Car provided an impressive end to the hike – the rain had stopped and, emerging from the tunnel, we were carried gently away from the dramatic silhouette of the mountain, standing majestic and unmoving in the gray evening mist.